It is really cold in Sydney today. I’m not going to buy into the Sydney/ Melbourne weather debate because I think it is about the most boring conversation that you can have – but really Sydney is this all you’ve got? It’s enough to make you think a day lounging around in bed with the papers would be nice (I wish it was Saturday). It would be extra nice if my room looked like this. I love how this shelf allows you to continue the style and colours of the bedding and bedhead up the wall creating a perfect layered look. Think about what you place on this shelf- it needs to be in harmony with the room so that it doens’t look messy. Think about matching frames and cushions colours to keep it neat. Think about using a floating shelf to avoid the bracket. DON’T use this space for family photos or any photos – it is not the mantle! DON’T be too matchy – create a little haven for beautiful things that you love looking at. You have two options- symmetry or balanced mismatched- pick one and stick to it. One of the key strengths of this image is the perfect use of gold from the side table, to the wall clock to the ceiling pendent- copy this order to get a seamless result! PS – what do you think about the purple colour? I am not a purple fan but it keeps growing on me and popping up in unexpected places- like stunning bedrooms! 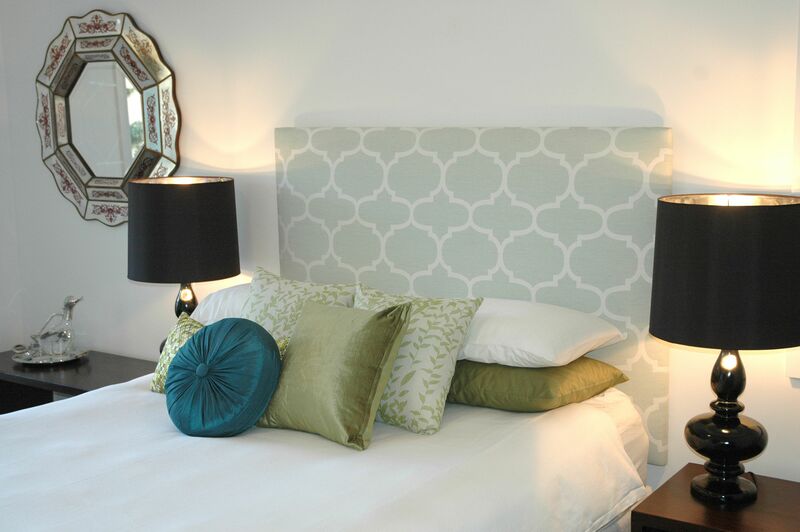 I recently completed a bedroom for a client and one of the key elements of the design was a padded bedhead. Now it seems that padded bedheads are a bit omnipresent at the moment but you don’t have to fork out a fortune for a tufted one or be stuck with a boring beige one either. Any upholsterer can cover a board for you and provide a handy bracket to fix to the wall. 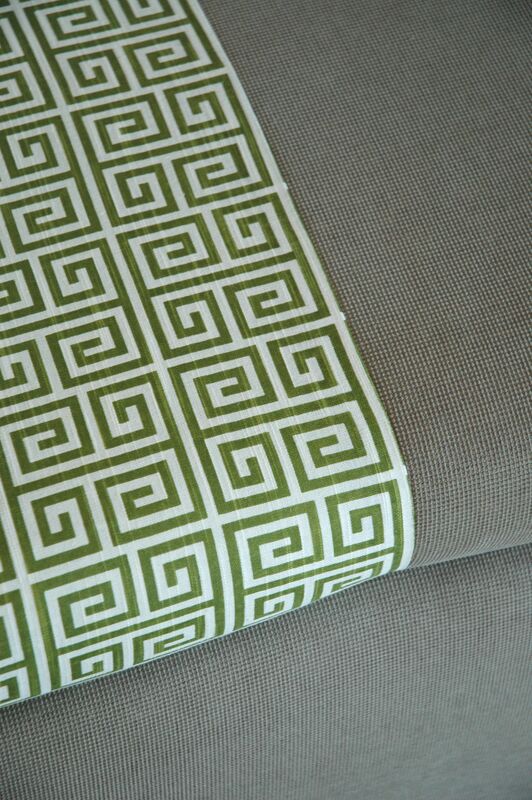 Cover the bedhead later with a new fabric when you get sick of the print or simply remove the brackets and paint the wall if you are over the idea. I got this one covered including fabric and brackets for $500. 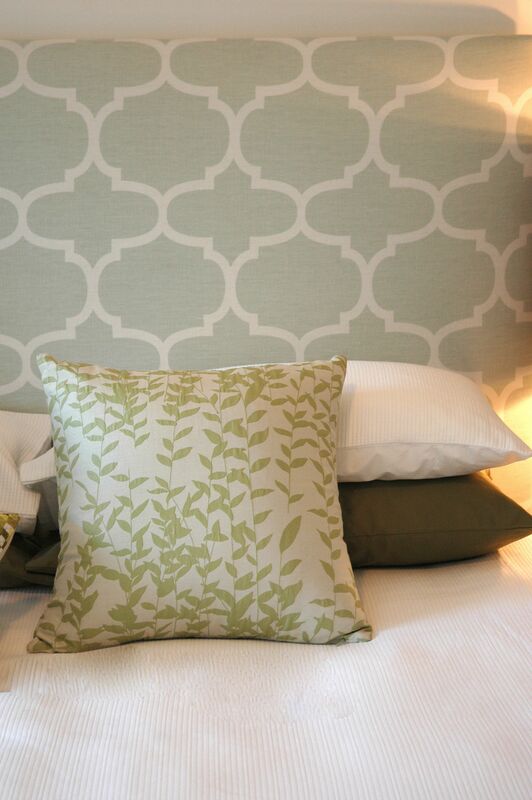 Think about different colours that might suit your style- if you go heavy on the print you can decide to go minimal on the bedding, or clash prints for a more adhoc look. I decided to use this larger print in the room for a client who wanted a minimalist room that is still inviting – the large size of the bedhead occupies a good amount of the wall space but let’s the rest of the room feel clean and sparse. This look suits the glam styles that are big at the moment but it could be alot more relaxed with a lower bed, messy cushions and the use of two fabrics on the bedhead (consider a horizontal split with one large fretwork and the other a different print. There are a lot of these prints around in green, aqua and yellow- all great colours for a spring lift.